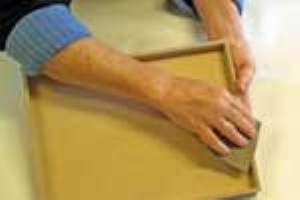 Sand the wooden shoebox with a piece of the 300-grit sandpaper to smooth any splinters or rough edges. 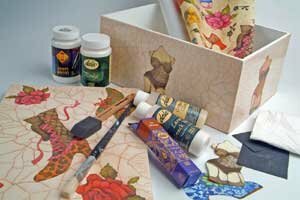 With foam applicator, paint the shoebox with 3 – 4 coats of Dala White craft paint. ALLOW DRYING BETWEEN COATS and applying each coat in the opposite direction to the last. Dry sand with 800-grit sandpaper. Use small, light circular movements to remove brush stipple marks until surface feels smooth to the touch. Apply the cut out images to the wooden shoebox. First apply Dala Podge to the wooden shoebox. Place the image carefully down and using a small, flat paintbrush or fingertip dipped in Dala Podge, massage the picture down from the centre outwards in small movements. Make sure all creases and bubbles are removed to the outside edges. 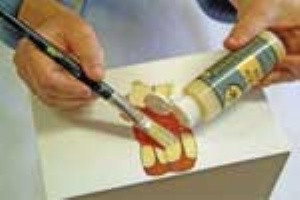 If picture is large, a hard roller is suggested to avoid creases, or dip image quickly into water to soften before settling it onto the podged surface – this helps to “spread” and flatten the image. Cover whole wooden shoebox with a further two coats of Dala Podge, DRYING between coats. This act as a sealer to the pictures and painted surface. With a paintbrush, apply one good coat of Large Crack Base over the wooden shoebox and lid and allow to dry for about an hour. Keep fingers off the dried surface. With a brush, apply one coat of Dala Crackle Glaze over the dried base coat, making sure that the whole area to be crackled is covered. Leave the object to dry NATURALLY IN A WARM ROOM (24 hours in summer or 24-48 hours in cold, wet weather). The longer you leave it, the more definite and deep the cracks will be. DO NOT BLOW-DRY. Squeeze a small amount of the new Dala Antique Rub onto a soft cloth, and rub well into the entire crackled area. Repeat with more Dala Antique Rub as you work your way over the crackled surface. It is only at this stage that the cracks will be visible. Allow to dry for one day. Take a clean soft cloth and buff off the excess Antique Rub. Seal the surface with two – three thin coats of clear, oil-based varnish – dry well between coats. Wash the brush in turpentine. Antique Crackle is a technique that requires some PATIENCE!! Practice on a small square of wood before committing yourself to the technique. Crackling relies somewhat on atmospheric conditions i.e. dry heat or humidity, and not just its chemistry to crack – cracks will appear faster in summer and slower in winter. Do not attempt to force the crackle to dry by using direct heat of any kind e.g. full sun, hairdryer, heater or oven – this will have a shallow splinter effect on your work and the Dala Antique Rub will not stay in the formed cracks, looking ineffective. NEVER use water/water-based varnishes as finish over the crackle glaze – it will dissolve the crackled surface – REMEMBER CRACKS HATE WATER !! This item has 1216 views.